Black & White There is 1 product. 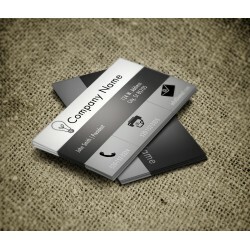 BLACK AND WHITE BUSINESS CARDS Printed on 10pt Paper stock The most professional and cost effective way to promote your business. Fast Service - Custom Designs ready in 1 to 2 business days! * Save Big Money on Split Orders - get your colleagues to order with you and save!! Quick Shipping - Cards ready / shipped within 3-5 business days after Approval!